Have you noticed your plush carpet getting an odd look to it, almost a cornrow appearance? It is absolutely a real problem. Let’s explore about this and what to do to help avoid or alleviate this problem. More than likely this is happening in a carpet with more of plush design. It is most often seen in the highest traffic areas. It will look like the carpet is almost matted or tangled in appearance. It begins to form in a row formation. This can cause people to want to replace their carpet sooner as well. When manufactures make carpet, the longer (or plush style) piles are tufted further apart than a shorter dense carpet. This is usually where you will find corn rowing in your carpet. Never fear though, we can help you keep your carpet from corn rowing. Vacuum the correct way. Of course, it is important to be doing it correctly. Be sure to check out this video for tips on buying a new vacuum. Also, be sure that the brushes of your vacuum are touching the top of the carpet pile. Don’t vacuum too deeply. It will cause damage to the carpet fibers, causing more of a matted look. Professional Cleanings. This is important for a number of reasons. It will help get rid of embedded dirt and grim, but it can help restore the nap of your carpet. 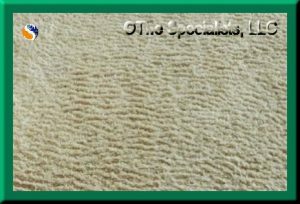 A high-quality cleaner, such as The Specialists, can help restore your carpet to a like new look and feel, when coupled with a proper maintenance schedule. We recommend that your carpets be professionally cleaned at a minimum of once every 12 to 18 months. You can also have them deep cleaned every 6 months for extra busy homes with little ones and furry family members. Rake your carpet. Although this has fallen out of common practice with shag carpet not being as popular. It is very important to rake or groom your carpet. 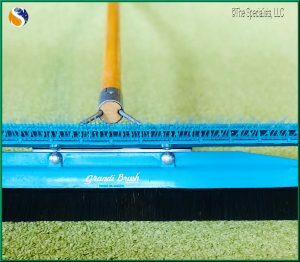 A good carpet rake will have soft bristles and can help fluff and restore the pile on your carpet. Handy tip, a good professional carpet cleaner will groom your carpet before leaving your home. They can also sell you a carpet rake as well. Choose quality padding and professional installer. This is the foundation for carpet, be sure to ask for a high-quality carpet pad. Improper installation can sometimes lead to corn rowing as well. The same applies to hiring a high-quality person to re-stretch your carpet as well. Check your door ways. If your doors were hung over hardwood or bare floor (or just hung improperly) this will cause them to rub on the carpet and cause corn rowing. Don’t forget to call us for your annual rug maintenance at (916) 348-7018.